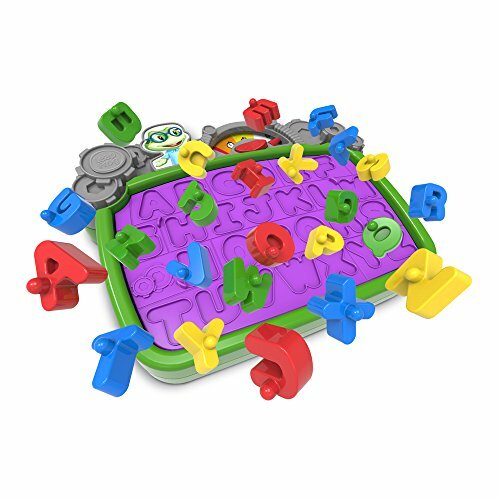 Make learning a blast with LeapFrog Leaping Letters. Designed with kids ages 3-6 in mind, there are plenty of ways to play for fast-action alphabet learning fun. Kids race against the clock to put all the letters pieces in their spots before time runs out and they go POP! Put alphabet skills to the test with an adjustable timer that allows all ages to get in on the fun. Change up the level of difficulty easily with color-coded letter pieces that let kids progress to using all 26 letters of the alphabet when they're ready. Advance to word building and start forming words with add-on activity cards that make beating the clock an exciting challenge. No batteries required. Learning is a blast! With an adjustable timer, color-coded letter pieces and extra activity cards, kids practice matching skills, the alphabet and more. Includes leaping letters, 26 letters, word building card, and word building list. Turn the timer dial to desired level and flip the start-stop timer button. It's a race against time to get all the letters into place. An adjustable timer and color-coded play-pieces help keep it fun for everyone. Plus, when the timer stops, the tray really makes the letters pop. Share the fun with Mom, Dad, and a buddy or just play solo. Two can play together or take turns. Get in on the fast-moving action and develop fine motor skills while matching letters.